New York: Book-of-the-Month Club INC., 1989. This is the hardback edition of the second printing of the Book-of-the-Month club edition of The Joe Leaphorn Mysteries: Three Classic Hillerman Mysteries Featuring Lt. Joe Leaphorn. This edition is an anthology of the first three novels from Tony Hillerman's Navajo Mystery Series. 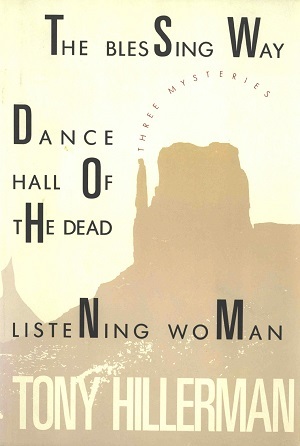 This anthology includes: The Blessing Way (1970), Dance Hall of the Dead, (1973), and Listening Woman (1978). This edition was specially printed for the Book-of-the-Month club and the bar code, price, and ISBN number have been removed from the dust jacket. The cover features a tan and oatmeal colored photograph of a Southwestern vista including geologic features, clouds, and desert. The photograph is credited to Mark Scott and the jacket was designed by Sandie Benedicto. Format: Hardback, 20.8 x 14.8 cm. Binding: Gray speckled board with a dark blue cloth spine. The titles, author, and Book-of-the-Month logo are printed on the spine in a metallic copper.